Carol Handley shares some conversation (and a birthday) with Herbie Hancock about his two year, seven continent album, The Imagine Project. Herbie talks about working with producer Larry Klein, the musicians on the release as well as his thoughts on being a global citizen and communicating with emoji’s. Carol Handley talks with music icon and keyboardist Herbie Hancock. The conversation was recorded after his album, The Imagine Project, released in 2010. In 2010, keyboardist Herbie Hancock released The Imagine Project. The 12-song album was recorded with dozens of artists on seven continents. The undertaking took two years of production effort and was produced by bassist Larry Klein whom Herbie worked with on his Album of the Year Grammy for River, The Joni Letters. Carol Handley had a conversation about the project’s theme, some of the sessions and turning 70. 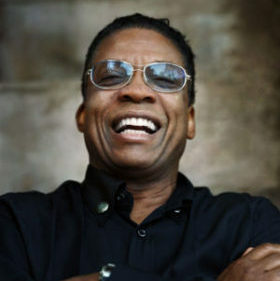 Herbie Hancock’s career spans many decades, with his work with Miles Davis and the VSOP groups, into the contemporary surroundings with today’s music creators in the jazz, pop, rock and blues genres. His early adoption of electronic keyboards is part of his artistry and helped to cement his musical heritage as innovator and futurist. Like Miles, he doesn’t stand still. Building on jazz fundamentals is only part of his sonic pallete. As a piano player, he is often identifiable in just a few notes. A rare voice in the history of music, you will get a sense of his world-view and humor in the conversation. As the US ambassor for World Jazz Day, April 30th, we honor and celebrate Herbie Hancocks contributions. Read the content of the Herbie Hancock conversation for Musicians on Mic or to listen to the Herbie Hancock podcast, click either the play button at the top of this page or on the link at the bottom of this page.